Hello! I have another card to share that I created with the new My Favourite Things Jungle Friends card kit! This fun, jungle themed kit includes everything you need to make a ton of cards including a stamp set, 2 die-namics sets, patterned paper, cardstock, and 1 package of Spin & Slide discs. And the best part... everything is perfectly coordinated together so all you have to do is create! The kit is officially available now in the MFT online store. For my card tonight I used the giraffe die to create an interactive card where the giraffe can move up to eat leaves on the tree. It's so fun to make the animals spin and slide on cards... so unexpected and fun for the recipient. I created the scene first by diecutting the rectangle panel and the grass pieces from white cardstock and then I used distress inks to add colour to them with an ink blending tool. Once I had the pieces inked up I spritzed some water on them and then dabbed it off with a paper towel for a distressed look. I diecut a giraffe image from white cardstock and used Copic markers to colour him in. I added spots of colour and shading to try and make him look more realistic. I diecut a spinner channel into the blue sky panel with the Surf and Turf die-namics and then adhered my giraffe with the spin & slide discs that come in the kit so he could move up and down the open channel. I diecut the branches and leaves from the Jungle Friends die set, coloured them in with Copic markers and adhered them to the top of my scene so the giraffe would reach the leaves when he slid up the card. I finished the card by adding some diecut clouds and stamping the sentiment directly on one of them with black ink. I also added gems to the giraffe for his eyes. I love the dimension they add since the image is completely flat. Thanks so much for joining me for the new Jungle Friends card kit reveal. Don't forget to head over to the MFT blog for all of the details on this fun new kit and to see more samples from the creative team! The gems look great. Such a cute card! Great idea to have your giraffe climb the hill for the leaves! The options for these slider dies seem endless! Super cute card! I love how the giraffe moves up to eat the leaves off the trees. This is too cute! I love that you thought to have him pop up to eat the leaves. I love you hid the slider behind the giraffe! Super cute, love the sweet giraffe! Love how you pieced that sweet giraffe! Soo cute! This is a fabulous kit! Super cute idea of having the giraffe pop up from the grassy hill. The answer is the giraffe- message put into action! What a fun card! Great colors. What's up is one fantastic card! Your giraffe is adorable! Thank you for the smiles today! so graceful. Love the card - reminds me on my trip. 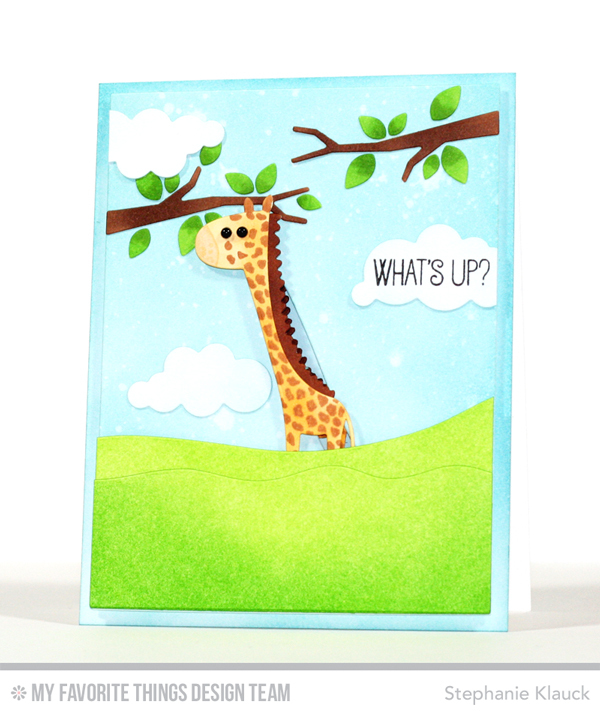 Love that giraffe, and how you used the slider so he can peek his head up higher....your color choice is perfect too! How fun--love how the giraffe can eat the leaves. So cute! 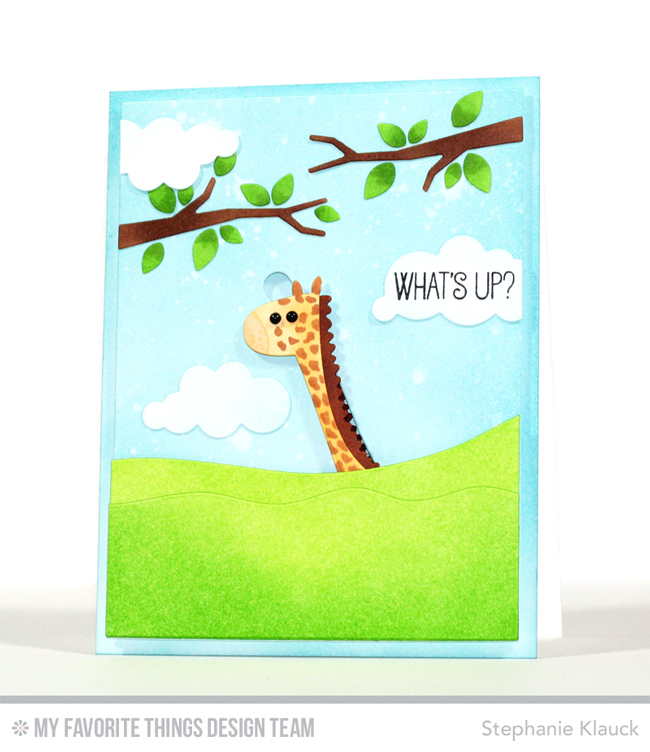 Love that giraffe and the cute scene you created! The gem eyes really bring the giraffe to life. So cute! Super sweet card - love the scene you created. 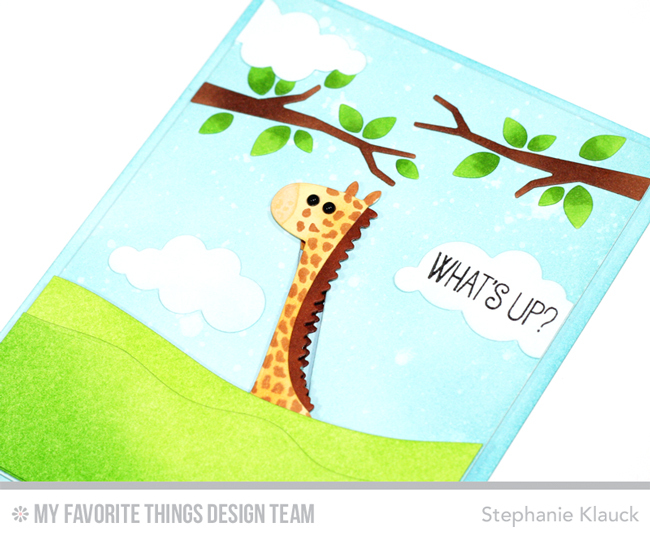 Cute hiding giraffe... a great way to make the slider. Love how you use this kit, so fun!